Reward and recognition schemes come in all shapes and sizes, but what constitutes a good one and how do you judge success? When considering this question it can be helpful to look at what other organisations are doing, but in our view, the best way to start is by understanding what reward and recognition is, what it can achieve and what it should deliver for your organisation. What is reward and recognition? Though the HR and employee engagement community has taken to talking about ‘reward and recognition’ as a single concept, they are in fact different things: reward is essentially pay, recognition is a gift. Of course, the two often go hand in hand, however the distinction is an important one, as it allows organisations to understand where reward fits in to a broader HR/employee engagement strategy. Reward and recognition is the activity we engage in to acknowledge exceptional performance and encourage specific values or behaviours. How should reward and recognition schemes be implemented? Reward and recognition programs are implemented in different ways: from manual, paper-based systems to fully automated online portals that can be accessed remotely. Each employer will have different systems in place but central to a scheme is a mechanism that allows employees, whether that be managers or peers, to recognise their colleagues’ efforts by nominating them to receive a reward. Recognition can be monetary, non-financial or simply a public acknowledgement of someone’s efforts and often it’s this act of public recognition that has the greatest impact. It sounds simple but saying thank you (and encouraging managers and colleagues to do the same) can be the most effective way to recognise hard work. 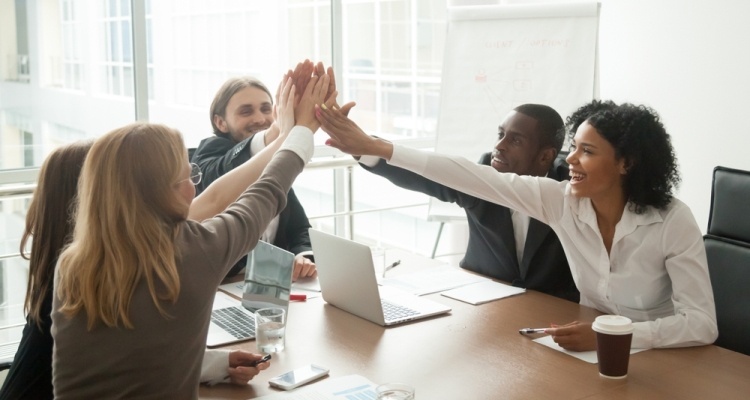 Whether in a handwritten note or at a team meeting, a study by Glassdoor found that 80% of employees would be willing to work harder for an appreciative boss and 70% said they’d feel better about themselves and their efforts if their boss thanked them more regularly. The best schemes make it quick and easy to nominate colleagues, publicly celebrate staff achievements and redeem rewards. In our experience, those schemes tend to be fully automated, online portals. Particularly for large organisations that may have remote workers or employees based across lots of different locations, this is the best way of encouraging staff to use a scheme. What should you be looking to achieve? Reward and recognition schemes should motivate, engage and encourage positive behaviours amongst your staff. The best schemes send a clear message that your organisation recognises an individual’s or a team’s hard work throughout the year. Aligned with the wants and needs of the business: be very clear about which staff behaviours and performances are being rewarded; how and why. Reflective of an organisation’s values: recognition awards can focus heavily on things such as effort, enthusiasm or softer, value-based attributes. For example, if ‘creative thinking’ or values such as ‘integrity’ are important to your organisation, make sure people are recognised for them. Allow for spontaneous recognition: our own research on this topic found that receiving rewards spontaneously and for good work was more likely to make employees feel recognised than receiving them at events such as Christmas or on their birthday. Fair: if rewards are deemed to be biased toward particular individuals or groups it can be a big demotivator for the rest, as evidenced by a well known experiment on Capuchin monkeys that shows that even animals are demoralised by unequal rewards. In our view, the best schemes make a very clear link between an organisation’s core values and the attributes for which employees are recognised and rewarded. How should you judge success? The best schemes capture an array of data and there are some simple things that you should be looking at. In particular, the level of engagement and approvals (i.e. how many employees are using the scheme). More broadly, you can assess (via employee surveys before and during the implementation) the extent to which a scheme is delivering against your KPIs. Do your team feel recognised for their work? Do they understand the link between recognition and the company’s core values? Are your employees feeling motivated and engaged? How do I know I’m getting good value for money? The industry average spend for a reward and recognition scheme is between 1% and 2% of payroll, a figure that has been backed up by various surveys. If you’re spending no more than that amount and achieving good results, then it’s safe to say you’re getting good value for money. Interested in developing a reward and recognition scheme within your own organisation? Find out where to start in our ebook on how to create an effective R&R strategy.